Mnuchin suggested that the US may in future look to renegotiate long-standing deals, including those agreed within the framework of the WTO. 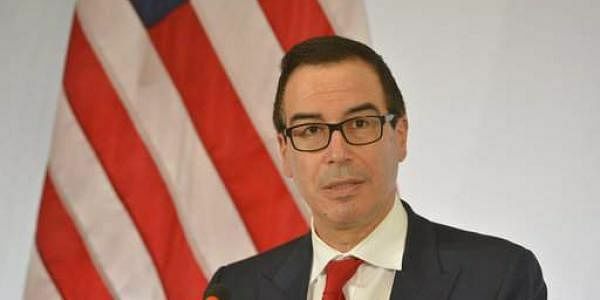 GERMANY: US Treasury Secretary Steven Mnuchin on Saturday shrugged off an outcry over the omission of a long-standing anti-protectionist pledge from a G20 statement, saying language used in the past is "irrelevant." "The historical language was not relevant," he told journalists after the gathering of finance ministers and central bankers in Baden Baden, western Germany. "What is relevant is what we agreed as a group: to strengthen the contributions of trade to our economies and we will strive to reduce excess global imbalances to promote inclusiveness and fairness and reduce inequality." "I think that accurately reflects what we as a group talked about." After a two-day meeting, ministers from G20 developed and emerging nations said they were "working to strengthen the contribution of trade to our economies," but failed to spell out a pledge to reject protectionism in a closing statement. The G20 has in the past pledged support to the existing multilateral trade system, including the World Trade Organisation (WTO). But Mnuchin suggested that the US may in future look to renegotiate long-standing deals, including those agreed within the framework of the WTO. "We want to re-examine certain agreements, we have talked about re-examining NAFTA," he told journalists, referring to the North American Free Trade Agreement between Canada, Mexico and the United States. "We think there are parts of the WTO that are not being enforced and will look to aggressively enforce things in the interest of American workers, and to the extent the agreements are old agreements and need to be renegotiated, we’ll consider that as well," he added. He also dismissed concerns that the communique did not reaffirm G20 members' commitment to the 2015 Paris climate accords, saying it did not fall under his remit as treasury secretary. "That's more of an issue for G20 leaders" when they meet in Hamburg in July, he said.